Burnhamthorpe Gardens! Absolutely Stunning Custom Built Home! Incredible Quality Finishes! Nicely Thought Out Floor Plan, Beautifully Finished Lower Level, With Heated Floors. Soaring Ceilings, Wonderful Millwork, Wide Plank On Trend Blonde Oak Flooring, Grand Dining Room With Servery Gourmet White Kit With Caesarstone & High End Appliances! Lavish Master Suite! Over Sized Lot Perfect For Pool! Convenient Location! Gorgeous Custom Built Home Imbued With Elegance From Corner-To-Corner! This Stunning, Professionally Finished Smart Home With Over 4500 Sq. Ft. Of Living Space Offers 6 Parking Spots, 4+1 Bdrms All W/ Attached Baths & Walk-In Closets W/ Custom Organizers. Kitchen Boasts Custom Cabinetry, Quartz Counters+Backsplash, Sub-Zero & Wolf Smart S/S Appliances & More! Outstanding Layout With Huge Beautiful Rooms + Loads Of Storage Space. 5+1 Bedrooms. Designer Decor. Gleaming Sparkling Clean. Hardwood & Marble Floors On The 2 Main Levels. 6 Washrooms. Parking For 8 Cars. Massive 60'X160' Landscaped Lot. Fully Fenced Ultra-Private Backyard. Finished Basement W/Nanny Quarters + Rec Room With Wet Bar. Perfect For Large Family Gatherings. Highly Sought-After Location In Etobicoke's Burnhamthorpe Gardens. Find all Islington Homes for sale at Etobicokeforsale.com ! We have specially mapped out by price range the Islington Centre West neighbourhold with all the MLS listings currently advertised for sale on Realtor.ca from our Toronto Real Estate Board TREB. Islington is a neighbourhood in the west end of Toronto, formerly Etobicoke in Ontario, Canada. It was originally a village in the Township of Etobicoke, which later became the Borough of Etobicoke, and then the City of Etobicoke. Etobicoke merged with five other municipalities and a regional government in 1998 to form the new "City of Toronto". The approximate modern boundaries of Islington are Rathburn Road in the north, Islington Ave in the east, The Queensway in the south and a block west of Kipling Avenue in the west. Condos are invading the Six Points corridor and moving west toward Hwy 427 along Dundas Street West. The same stretch from Kipling to the 427 along The Queensway is also experiencing major Retailers Big Box stores , fast food chains and Automobile dealerships to invade the area to service the new Condo residents and or tenants. New restaurants, more Starbucks, updated Tim Hortons, and major Sherway Garden expansion of American Retailers have increased the value of property in this area immeasurably. And is still growing so it is still a great time to buy and especially sell. Islington was originally known as Mimico. When Mimico-on-the-Lake petitioned the government for a new post office to be called Mimico in 1858, Mimico was renamed Islington, a name suggested by a resident who was born in the English city of the same name (see Islington). The Toronto Transit Commission's Bloor-Danforth line was extended to Islington in 1968 with the establishment of Islington station at Islington Avenue and Bloor Street West. Not long after the station was constructed, there was a boom in high-density office and residential development. 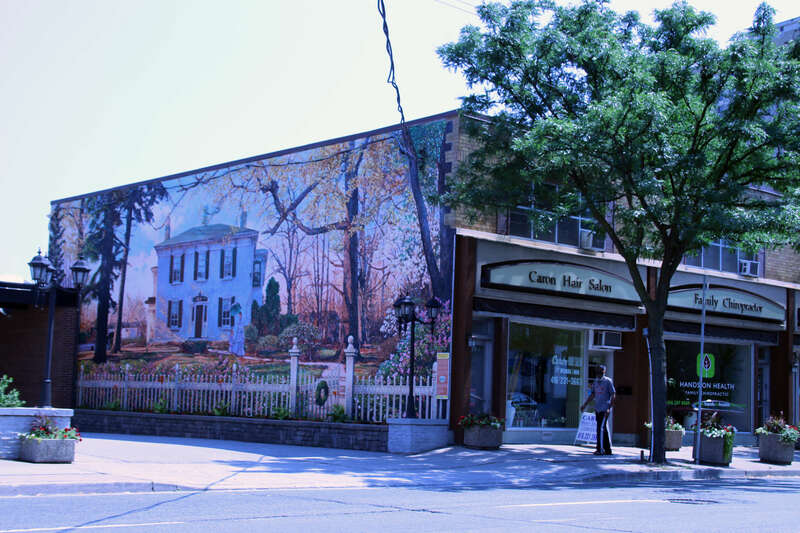 Dundas Street west of Islington Avenue has been designated a Business Improvement Area known as the Historic Village of Islington. 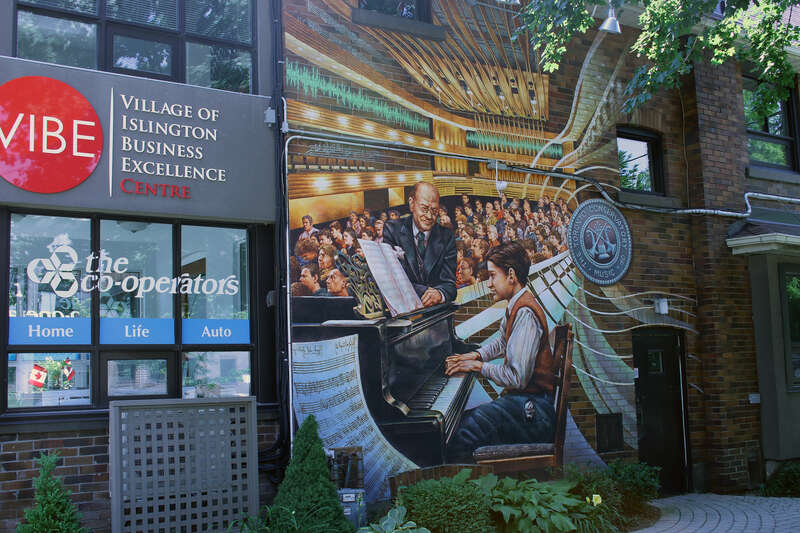 The Murals throughout the Village have defined the history of this area which Gordons Dairy , Michael Power School, Thorncrest Ford used to inhabit. Condos , restaurants , Pubs, and the Tapestry are the new residents as Etobicoke's City Centre is redefining. Montgomery's Inn is also located in Islington, on the south-east corner of Islington Avenue and Dundas Street West. Dating to 1830, the inn is an example of late Georgian architecture. It currently houses the Etobicoke Community Museum and is open to the public. A Farmers Market is held in the parking lot of Montgomery Inn on Wednesday from 2-7 in the summer and in the winter its indoors. Islington Centre home prices are vastly changing with the huge influx of new build homes. Older smaller homes fetch over $700,00 while new builds are now selling over $1 million and up. Our closest Remax office to you is either across from Cloverdale Mall on the East Mall or at 4242 Dundas Street West in the Brunos plaza east of Royal york Rd. Come and meet us there!